Summary / KeywordsIn 2008, Victoria artist Trace Nelson embarked on a research project to construct 100 sock monkeys. It didn’t take long before her research veered into new hypotheses and materials. The cuddly toy monkeys morphed into life sized simian sculpture. 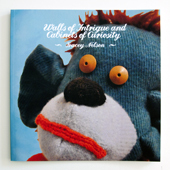 Nelson’s murals and drawings attended the sculpture—and monkey furnishings upholstered with reused sweaters, video peepholes and a drawing robot animated a rampant installation. Art historian Jan Gates discusses Nelson’s project from the perspective of the historical cabinet of curiosity, interrupted by monkey back talk.